I've been tailing Edna and Paul for the past 15 minutes waiting for the perfect moment to photograph their wedding day while driving from one venue to the next. 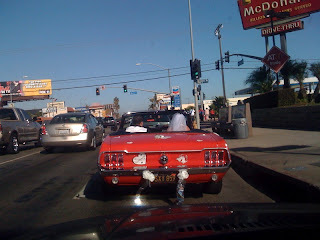 They looked so cool in their vintage Mustang convertible. Everyone was driving by and honking at them as a way to congratulate their recent nuptial. This is such a Southern California Style Wedding. :-) I'm glad to be part of their special day.